Fox Crime in Norway has launched The Walking Dead Season 2 with a zombie make-up competition. 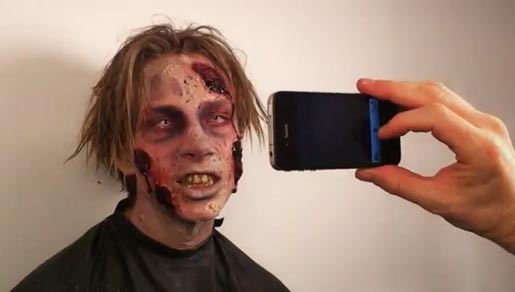 Contestants are able to compete for the first prize of an iPhone 4S by submitting their zombie films. Submitted films are to be published on Fox Crime’s Youtube channel, with the winner announced in week seven. The competition is being promoted with Youtube commercials demonstrating zombie make-up effects in action. Start with no makeup, or similar effects, to make the transformation most extreme. Using an iPhone, take several still images from the same angle. Gradually apply makeup and take pictures along the way. Keep the same angle all the time. Edit out superfluous images so that the transformation is evident. Photo View feature on the iPhone is used by the “slide” or by pressing the arrow inside. The images will then be a continuous film. Use another device to film viewing sequence, for example. a phone or a camcorder. Voila! You have now created a still image film that can mailed to Kontakt@fox.com. The Zombie Faces campaign was developed at Frank, Oslo, by creative directors Erik Heisholt, Lee Cartmell, art directors Jason Kinsella, Kasper Tuvnes, copywriters Jason Kinsella, Erik Heisholt. Sound and music were produced and edited by Benjamin Aker, performed on the Omnisphere Burning Piano.